Budapest, district 2, Dényán utca 3. The renewed and very familiar BÜRO PANZIO is waiting for its guests in the heart of Buda, very near to Moszkva square. In all of our rooms you can find separated bathroom, air-condition, colour TV, telephone and mini-bar. Between 8-10 o'clock be our guest for a self-service breakfast! Our Guests are allowed to use the Internet and the V-LAN for free. If you come to Budapest as a tourist,You can visit the main sights of the city (the Buda Castle, the Margaret Island and the Parliament) during a nice walk. You can reach the most popular shoping center of Buda in a minute, where hundreds of shops, good restaurants, movies, sport- and going out facilities can be found. If you do not feel like to go out, or before dinner, theatre, or going out you would like to drink something, you should visit our drinkbar. Our young and helpful colleges, working at our non-stop reception desk, rent a car for you, our help you to organise your programme and answer all of your questions. CLICK HERE FOR LOCATION MAP ! You arrive to BÜRO PANZIÓ by way of Budaörsi út, Alkotás út, Krisztina körút, Margit körút, Dékán utca. 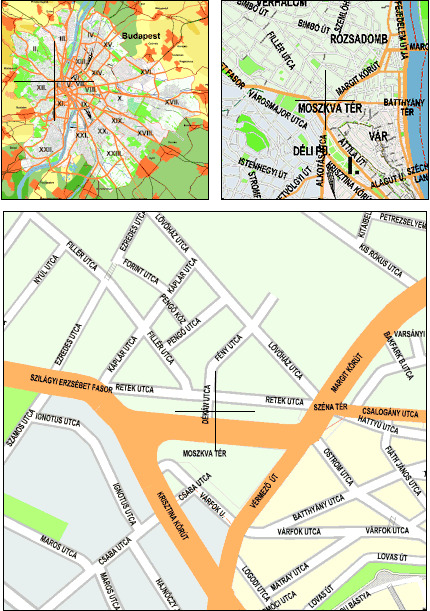 Bus 93 till the final station Kőbánya-Kispest, from there Metro 3 (blue line) till Nyugati railway station, then till Moszkva tér (final station) by tram 4 or 6. Or by Minibus (2300 Ft / person). By metro (red line) in direction of Déli pályaudvar (6 stations) till Moszkva tér, and then 1 minute walk. By tram 4 or 6 till Moszkva tér (6 stations), and than by walk. One station by metro (red line). By tram 2 till the final station Jászai Mari tér , then from there by tram 4 or 6 till Moszkva tér.